See what your clients have to say about our work. Our commercial services include paving of driveways, sidewalks, asphalt repairs, walkways and more. Our residential services include paving of driveways, sidewalks, walkways, asphalt repairs and more. Find out how A & A Asphalt Paving can provide you with a maintenance program suited for your needs. Our concrete driveway projects run the gamut of residential and commercial experience. Professionals in Commercial Grading, Leveling and Filling since 1986! Call now for an expert consultation. Liven up your blacktop surface with our amazing stamping process! Call now to schedule a consultation. Tar and Chip paving is a great way to stand out from the crowd! Schedule a consultation now! We'd love to discuss your next project. Nothing's too small, or too large! We can't wait to speak with you. 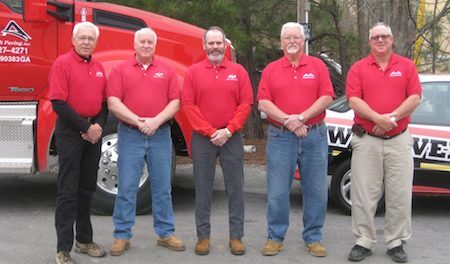 We are a professional asphalt and concrete paving contractor that has been servicing the greater Atlanta area for over 31 years. "For a SMOOTH Ride, Call A&A Asphalt Paving & Concrete!"